This is your community. You are the expert. Who knows the community better than someone who lives and/or works here? ReZone Albany is a rare chance for you to be a part of creating positive change, impacting the growth of your City for years to come. We need your ideas, input and feedback to ensure that the vision reflects community values and aspirations. We've stopped into the two previous workshops -- for the Warehouse District and Central Ave -- and they've been interesting, both as a way to learn more about the Rezone Albany project and just to hear the thoughts of the national consultants about various parts of the city. The South End workshop is the last of the currently planned events of its type. 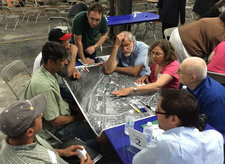 The products of these workshops are being rolled into proposed mixed-use zoning district that will help direct what sorts of development goes on there in the future.